The Warrior River borders the University of Alabama campus, separating old Tuscaloosa from up-scale housing developments to the north. Tuscaloosans know a “north of the river” address connotes six-figure incomes. The schools, public and private, are excellent. It’s the country club set. The Warrior River forms a barrier separating Tuscaloosans by class and largely, although not entirely, by race. The tornado missed the University of Alabama but stampeded through off-campus student housing; old homes converted into apartments or new, multi-story apartment buildings. Students are among the nearly 50 confirmed fatalities and many of the 400 still unaccounted for. 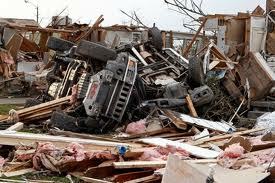 The tornado then tore into Alberta City. Alberta City expanded eastward toward Birmingham. As African-Americans moved in, white residents relocated, many of them north of river. Since moving to Tuscaloosa three years ago, I’ve crossed the Warrior River almost daily, and all but two or three times, I turned right onto the campus of the university or headed west into the old and prosperous downtown. The tornado devastated Alberta City and took with it the service-industry jobs upon which many of its residents—those who had jobs—depended. Many of the homes in Alberta City were uninsured. Its residents, people with so little, lost what little they had. North of the river, we lost electrical power for a day or so. When it came back on at 4:00 a.m. on Friday, I saw the scenes of obliteration. On Saturday, I joined a group from a Presbyterian Church in Birmingham who came to Tuscaloosa to cook hamburgers and hot dogs. A few members from First Presbyterian in Tuscaloosa showed up to help. The call had gone out for water, diapers, clothing, shoes, and other necessities. When I crossed the river, at first everything seemed fine—a few trees here and there uprooted. I turned off the Jack Warner Parkway onto Helen Keller Boulevard and headed for University Boulevard where a left turn would take me into Alberta City. At the roadblock I explained to a police officer that I was joining a group cooking food for victims. He told me to park and walk the rest of the way. I parked and started the mile-long trek into the heart of devastation. When I arrived at what’s left of Leland Shopping Center, I walked into a chaos of people frantically setting up cooking stations. Then a parade of SUV’s arrived. Many were Escalades, BMWs, Mercedes Benzes, and Toyota Highlanders, almost always driven by women. These were north of the river housewives who put on makeup and do their hair, don earrings and then walk the dog before heading off to the upscale Publix Supermarket where we folks north of the river shop. I helped unload SUV after SUV filled with bottled water, clothing items, diapers, sanitary wipes, and blankets. One very attractive woman in her early 40s driving a Lincoln Navigator asked, after I helped her empty its contents of bottled water and paper towels, if we needed anything else. I told her we needed flashlights. She asked where they might be found, and I answered that Home Depot just off 15th Street had not been hit and was open. She confessed that she did not know how to get out of Alberta City and over to 15th and asked if I’d ride with her. I agreed. It took us half an hour to navigate the Navigator through the rubble to Home Depot. She purchased $300 worth of flashlights. Then we drove back into obliteration. After a stranger gave me a ride back to my car, I drove north, crossed the Warrior River and headed to Publix Supermarket to pick up fresh fruit. There I ran into the soccer mom I had accompanied to Home Depot. I thanked her again for her help. She pointed out that the real challenge lay ahead. In a few days, many of the SUVs will stop coming from north of the river. Help will be arriving from FEMA and from private contractors but there is still so much to do. The soccer mom gets it. Mission trips from church groups are one answer, but just one. As Mayor Walt Maddox of Tuscaloosa pointed out, this is going to be a marathon, and we’re still in the first quarter mile of a long race.